Docked dragon boat during the Hari in Tomigusuku, Okinawa, Japan. The dragon boat race festival, also known as the Duanwu festival, known to be associated with Chinese culture and believed to have originated from China was only officially observed in China from 2008. Before that, it was unofficially celebrated there as it is currently unofficially observed by the Chinese communities of southeast Asia, including Singapore and Malaysia. own traditional Shintoism in its local style of boat racing. It is said that there are slight differences between the Japanese and Chinese styles. Their legendary roles and functions for conducting the races also seem to be different. 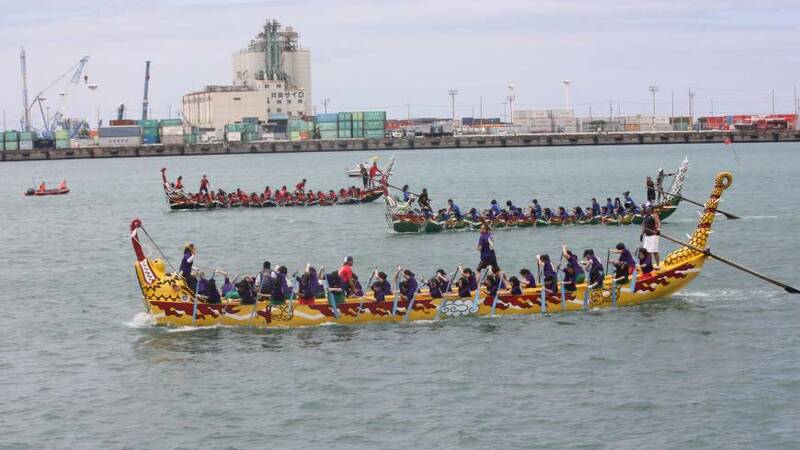 In Japan, Okinawa Prefecture has an ancient tradition of dragonboat races known as hari (ハーリー haarii). In the capital city of Naha, the Naha Hari (那覇ハーリー Naha Haarii) is performed as part of the national observance of Children’s Day, but in Itoman the Itoman Hare (糸満ハーレー Itoman Haaree) is celebrated the same day as the Duwanwu Festival on the Chinese lunar calendar. 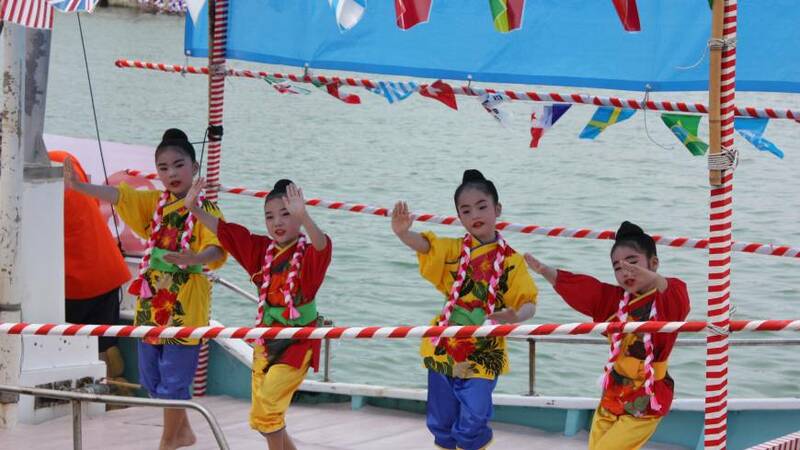 The city of Tomigusuku also has its own Tomigusuku Hari (豊見城ハーリー), but it is performed in late July Equivalent and related official festivals include Children’s Day in Japan, Dano in Korea, and Tết Đoan Ngọ in Vietnam. the Tohoku region in the north to the Okinawa islands in the south. It is difficult to specify when these traditional boat races originated, however, what we can observe is that, over the ages, boat racing has been performed for enjoyment and also as a part of traditional Shinto religious rituals. tried boat races to check the performances of their boats and show-off their boat building skills. This is how traditional boat racing developed and continued up until now. Traditional boat racing has become more common throughout the world, especially in the South East and East Asia areas, and Japan is no exception. In Japan, more of the traditional boat races have been performed in the western areas, with Hari boat races in Okinawa, Peiron boat races in Nagasaki, and Aioi City holding the more typical style of traditional boat races. There seems to be slight differences in accepting the styles of boat racing from China. Nagasaki inherited boat races closely related to the Chinese style, whereas Okinawa still maintains its own traditional. These days, numerous towns and villages are trying to resurrect traditional boat racing as one of the events of summer festivals for the purpose of revitalizing its people. However, their styles are mostly different from the traditional and old ones. Recent surveys tell us that approximately 260 boat races are being performed throughout Japan under the name of Tarai Matsuri (basin festival), Minato Matsuri (port festival), Ikada Matsuri (raft festival), Dragon Canoe festival, Peiron Festa, and Tenmasen racing (barge racing). account is that they were brought in from Fukien (Fujian) and Guangdong (Kwangtung), provinces in southeastern China on the East China Sea coast. Later, Hari boat races became a national event of the former Ryukyu (Okinawa) Kingdom and spread over Okinawa Islands as an oceanic god festival for abundant fishing and safety. Hari was originally a fisherman’s festival, but changed a great deal to a local festival after World. Nagasaki Peiron is said to have begun in 1655 when several Chinese ships were unable to leave Nagasaki Harbor due to strong winds and to comfort the oceanic god Peiron boat races were held in the harbor. Following this, Peiron spread gradually to neighboring towns and villages from coast to coast, and they served as a prayer for a good harvest, prosperity in local industries, rain, calm seas, water safety, etc. The Peiron boat is about 14 meters long with 30 paddlers, one drummer, one gongman and one steersman, a total of 33 crewmen on board. Boats race to the drums and gongs for a round-trip of over 1150 meters. Between May and June are the months in which to visit Okinawa if your aim is to witness the spectacle of fiercely contested races between crews paddling dragon boats or the Ryukyu Islands’ small traditional fishing boats calledsabani. During Golden Week, from Friday, May 3 to Sunday, May 5, Naha Hari festival will feature dragon-boat races in the city’s Tomari fishing harbor between large haryusen powered by 30 paddlers each. This year’s festival will be the 39th of the modern era, in which pop concerts, Ryukyu singing and dancing, a youth sumo competition and a fireworks display combine with the intensely competitive races to create a truly carnival atmosphere enjoyed by residents and visitors alike. From morning to evening during the three-day event, crews representing schools, companies, civic organizations and military units compete using the three traditional Naha dragon boats. Symbolically representing the three ancient towns that make up modern Naha, these dragon-prowed vessels with trailing tails are Naha’s dark-green-painted boat, the yellow one of Kume and the black beast of Tomari. Although dragon-boat racing can be traced back 2,500 years in China — to around the time of the first Olympic Games in Ancient Greece — local legend has it that the fearsome-looking craft first appeared on Okinawa about 600 years ago. In 1393, Wan-ōso (aka O Oso), the lord of Tomigusuku Castle and nephew of the King of Nanzan — the southernmost of the three kingdoms on Okinawa Island at the time — was a student at the Imperial University in Nanking, China. Having become enamored of the dragon-boat races he saw there during his stay, he is said to have had one built upon his return home to use on the Manko River. Soon afterward, impressed locals began building similar boats, and when Wan-ōso became King of Nanzan in 1403, he launched the Hari dragon-boat races to impress the gods and ensure good fishing, a bountiful harvest and peace in the kingdom. Today’s trio of Naha dragon boats are each 15.25 meters long with two rows of 15 seats for the 30 paddlers who sit side by side. Crews also include a drummer (or caller), who sits in the bow, a steersman (or sweep) in the stern, and a flag-puller, who positions himself near the bow to grab the all-important pennant attached to a float and so signal that his boat has finished the race. In Chinese tradition, the dragon’s eye is painted red prior to a race to bring the creature to life. So if a dragon boat is alive and the paddlers are its wings, the drummer is the dragon’s heart. Like the cox in Western rowing races, he directs the pace, frequency and rhythm of the paddlers’ strokes. Additionally, the steersman controls the course of the boat with a large “sweep oar” on one side of the stern — though Naha dragon boats often use two steersmen. As for the crews, synchronizing their paddle strokes in time with the drummer’s “heartbeat” is just as important as the speed and power of their strokes. Last year’s Naha Hari took place under mostly sunny skies and, as it’s held at the city’s fishing port, there was no shortage of food booths in front of the municipal fish market as well as inside the market itself. Typically, those attending can escape from the usual matsuri (festival) fare of yakisoba (fried noodles), corn dogs and okonomiyaki pancakes and indulge instead in island specialties such as maguro kama (grilled tuna “shoulder”), gurukun(bananafish), tempura bento (box lunches) and grilled tuna steaks or whole scallops. As well, for those looking for a fishy treat to take home, some booths also sell fresh local seafood, including kihada maguro (yellowfin tuna), kajiki (marlin),mekajiki (swordfish), mambo (moonfish), mibai (Okinawan grouper),irabucha (parrotfish) and umi budoh (sea grapes). Meanwhile, just as the Naha Hari festival happens during Golden Week in early May on the Western calendar, the Itoman Hare sea festival, focused on fishermen’s sabani races, is a one-day event held on the fourth day of the fifth month of the Chinese lunar calendar — on June 12 this year. The Hare is Itoman’s sole sea festival, and given that the city is famous throughout the western Pacific Ocean region for its tough and innovative fishermen, this is a major date that normally attracts around 30,000 revelers and spectators from far and wide. 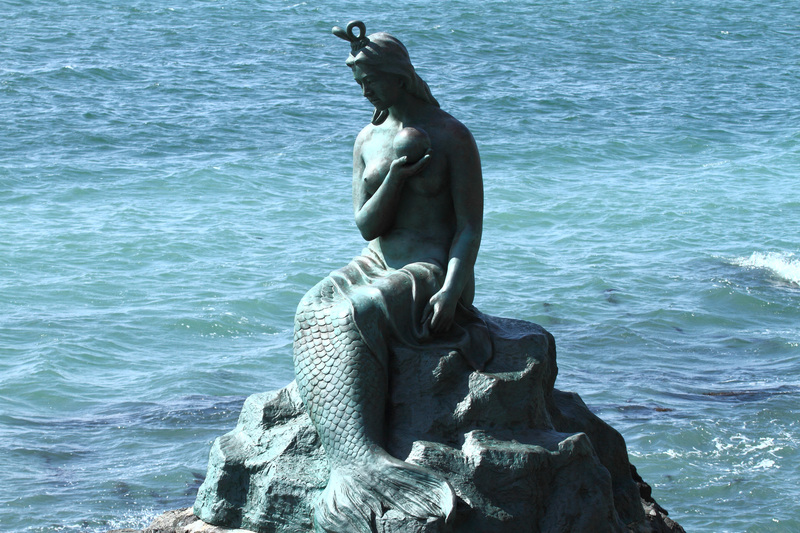 Like the Naha Hari, the Itoman Hare is held at the local fishing harbor to seek the gods’ favor for safe voyages and good catches. But unlike Naha Hari’s dragon-boat races, Itoman Hare’s are between sabani fishing canoes developed by Itoman fishermen more than 500 years ago. In the 19th century, those fishermen — wearing then newfangled goggles — would dive down from these boats to drive schools of fish into nets set ahead of them. Then, at the end of the 20th century they started using so-called fish-aggregating devices, which are basically lengths of rope or old fishing gear left dangling from flagged and anchored buoys. In the natural way of things, this detritus soon becomes host to mussels, barnacles, seaweeds and the like, which attract small fish to feed on them. Then larger fish such as tuna, marlin and mahi mahi (dolphinfish) soon turn up to feed on them — and it’s these the fisherman hunt using nets or hooks and lines. Sabani boats evolved from dugout canoes, to the sides of which strakes (flat boards) were added to raise the freeboard and prevent waves swamping them. Then, over time, the vessels evolved into the sabani’s now distinctive and streamlined fish-form shape. No iron or steel nails are used in building them, as their fastenings are wooden dovetail keys secured with bamboo nails. In earlier times, sabani were sailed as well as paddled, and though their narrowness and shallow draft made them fast, they were prone to capsizing. Being buoyant, though, they were easy to right and then bail out. This has given rise to one of the Hare’s most popular events, its kunnukase (capsize) race, in which the three boats must be tipped over mid-race so their crews have to right them, bail them out and get back aboard to resume paddling. This is to demonstrate the courage and seamanship of Itoman’s fishermen, as well as their strength and power as paddlers. At 6.8 meters long, the sabani are smaller than Naha’s dragon boats. They carry 10 paddlers, a drummer, a steersman and in some races a flag-bearer who stands amidship and chants and waves pennants to help synchronize the crew’s strokes. Around 9 a.m. on the day of Itoman Hare, the Hare bell is rung to symbolically announce the end of the annual rainy season. Then the Nanzan and Itomannoro (priestesses) perform a ceremony and the races begin. The opening event, the Ugwan Bare, is over an 850-meter course, as are most of the other races between schools, organizations and companies. But then, at the climax of the competition, comes the 2,160-meter Agai Subu contested between fishermen from Nishimura, Nakamura and Mijima — the three ancient villages comprising today’s city of Itoman. After the Agai Subu all the sabani crews go to the Nundunchu (House of the Itoman Noro) to sing the Hare song and receive awamori (Okinawan sake) from the priestess. Finally, after the festival ends, local legend has it that the souls of those who have died at sea have a race called the Guso Bare. Consequently, whether hungover or not, the day after the Hare no one goes fishing to avoid contact with the ghost paddlers. After that, it’s back to work out on the turbulent ocean until the following year’s festival draws excited crowds to Itoman’s shores again. The use of dragon boats for racing and dragons are believed by scholars, sinologists, and anthropologists to have originated in southern central China more than 2500 years ago, in Dongting Lake and along the banks of the Chang Jiang (now called the Yangtze) during the same era when the games of ancient Greece were being established at Olympia). Dragon boat racing has been practiced continuously since this period as the basis for annual water rituals and festival celebrations and for the traditional veneration of the Chinese dragon water deity. 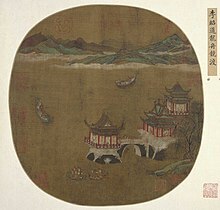 The celebration was an important part of the ancient Chinese agricultural society, celebrating the summer rice planting. Dragon boat racing was historically situated in the Chinese subcontinent’s southern-central “rice bowl”; where there were rice paddies, so were there dragon boats. Of the twelve animals which make up the traditional Chinese zodiac, only the Dragon is a mythical creature. 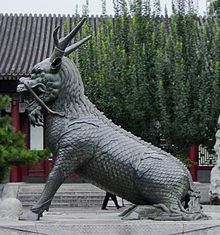 All the rest are non-mythical animals, yet all twelve of the zodiac creatures were well known to members of ancient Chinese agrarian communities. Dragons were traditionally believed to be the rulers of water on earth: rivers, lakes, and seas; they also were thought to dominate the waters of the heavens: clouds, mists, and rains. There are earth dragons, mountain dragons, and sky or celestial dragons (Tian Long) in Chinese tradition. Mythical dragons and serpents are also found widely in many cultures around the world. Based on this theory, some of these accounts have suggested speculatively that perhaps during ancient times, violent clashes between the crews of the competing boats involved throwing stones and striking each other with bamboo poles. This unsubstantiated idea claims that paddlers or even an entire team falling into the water would receive no assistance from the onlookers as their fate would be considered the will of the dragon deity. In this highly speculative scenario, boaters who drowned would have been thought to have been sacrificed. That Qu Yuan sacrificed himself in protest through drowning, in this line of thought, may speak to this early notion. However, this theory of human sacrifice is in direct contradiction of most accounts of the origin of the races, which hold that the dragon boat festival began as a way to rescue Qu Yuan. The traditional food zongzi is often thrown into the water, originating from the idea of keeping fish from eating Qu Yuan’s body. Modern academics continue to attempt to confirm the origin of the race, which is somewhat still open to speculation. Traditional dragon boat racing, in China, coincides with the 5th day of the 5th Chinese lunar month (varying from late May to June on the modern Gregorian Calendar). The Summer Solstice occurs around 21 June and is the reason why Chinese refer to their festival as “Duan Wu” or “Duen Ng”. Both the sun and the dragon are considered to be male. (The moon and the mythical phoenix are considered to be female.) 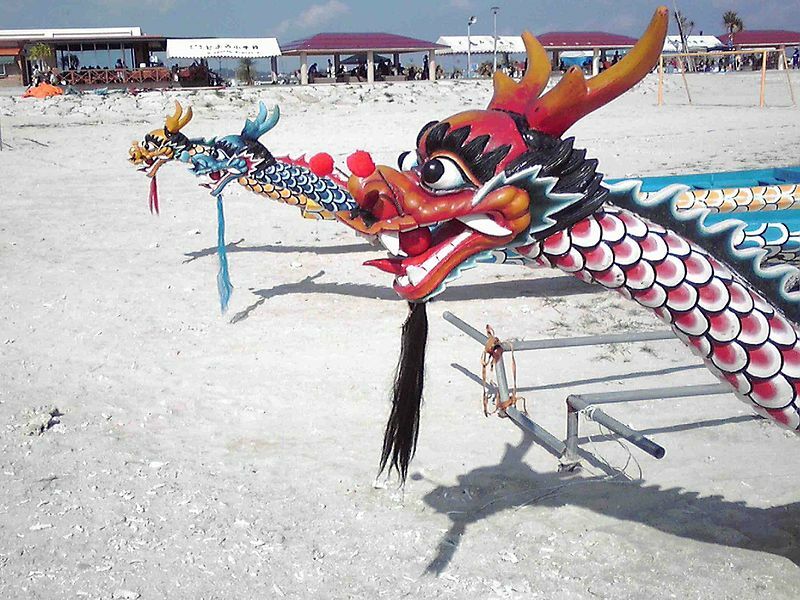 The sun and the dragon are at their most potent during this time of the year, so cause for observing this through ritual celebrations such as dragon boat racing. It is also the time of farming year when rice seedlings must be transplanted in their paddy fields, for wet rice cultivation to take place. Wu or Ng refers to the sun at its highest position in the sky during the day, the meridian of ‘high noon’. Duan or Duen refers to upright or directly overhead. So Duan Wu is an ancient reference to the maximum position of the sun in the northern hemisphere, the longest day of the year or summer solstice. This hot season is also associated with pestilence and disease, so is considered as a period of evil due to the high summer temperatures which can lead to rot and putrification in primitive societies lacking modern refrigeration and sanitation facilities. One custom involves cutting shapes of the five poisonous or venomous animals out of red paper, so as to ward off these evils. The paper snakes, centipedes, scorpions, lizards and toads – those that supposedly lured “evil spirits” – where sometimes placed in the mouths of the carved wooden dragons. Venerating the dragon deity was meant to avert misfortune and calamity and encourage rainfall which is needed for the fertility of the crops and thus for the prosperity of an agrarian way of life. Celestial dragons were the controllers of the rain, the Monsoon winds and the clouds. The Emperor was “The Dragon” or the “Son of Heaven”, and Chinese people refer to themselves as “dragons” because of its spirit of strength and vitality. Unlike the dragons in European mythology which are considered to be evil and demonic, Asian dragons are regarded as wholesome and beneficent, and thus worthy of veneration, not slaying. But if rainfall is insufficient drought and famine can result. Dragon veneration in China seems to be associated with annually ensuring life giving water and bountiful rice harvests in south central China. Another ritual called Awakening of the Dragon involves a Daoist priest dotting the bulging eyes of the carved dragon head attached to the boat, in the sense of ending its slumber and re-energising its spirit or qi (pronounced: chee). In modern dragon boat festivals a VIP can be invited to step forward to dot the eyes on a dragon boat head with a brush dipped in red paint made of the blood of a chicken in order to reanimate the creature’s bold spirit for hearty racing. * Worcester, George. The Junks and Sampans of the Yangtze River, 1971. Some modern researchers suggest that the stories of Qu Yuan or Wu Zixu were superimposed on a pre-existing holiday tradition. The promotion of these stories over the earlier lore of the holiday seems to have been encouraged by Confucian scholars, seeking to legitimize and strengthen their influence at a time when other belief systems were seen as gaining influence in China. The deaths (and lives) of both Qu Yuan and Wu Zixu were recorded in Sima Qian‘s Shiji, completed 187 and 393 years after the events, respectively. While Sima Qian gave high praise to both characters, there is no evidence showing any link between the historic account of these characters in Shiji and the popularity of the festival in their names. Many traditional rituals of the Duanwu Festival emphasize the avoidance of disease(see Horses, Dragons, Disease in Nara Japan by Michael Como, Japanese Journal of Religious Studies 34/2: 393–415). The desire to prevent health hazards associated with the mid-summer months may have been the primary original motive behind the holiday. Another theory, advanced by Wen Yiduo, is that the Duanwu Festival had its origins in dragon worship. Support is drawn from two key traditions of the festival: the tradition of zongzi, or throwing food into the river, and dragon boat racing. The food may have originally represented an offering to the dragon king, while dragon boat racing naturally reflects reverence of the dragon and the active yang energy associated with it. This combines with the tradition of visiting friends and family on boats. Another suggestion is that the festival celebrates a widespread feature of east Asian agrarian societies: the harvest of winter wheat. Offerings were regularly made to deities and spirits at such times: in the ancient Yue, dragon kings; in the ancient Chu, Qu Yuan; in the ancient Wu, Wu Zixu (as a river god); in ancient Korea, mountain gods (see Dano (Korean festival)). As interactions between different regions increased, these similar festivals eventually merged into one holiday. The content of the Dragon Boat Race ritual is quite complex. Researchers have investigated the ritual’s meaning, function, and organization, its relation to production and political power, the legends of its origin and related folk beliefs, and the symbolism of the dragon and the dragon’s multiform powers. Confining ourselves to Mainland China, we can say that the “classic” Dragon Boat Race is held on the fifth day of the fifth month of the old calendar, and is linked to the legend of the poet Qu Yuan of the Warring States period. The race introduced in this video is of the type connected with this legend. The ritual practices and various religious customs in the documentary show the general procedures of the Dragon Boat Race. through the settlement. In view of the long gap in our knowledge of the detailed circumstances of the race’s ritual practice on the mainland, every single piece of information recorded in this visual ethnography is of great importance. What evils are sent away or expelled? Some points of the present article suggest the answer that it is the deceased souls[the practice here is similar to the chinkon practice in Japan and Japanese silk thread weaving myths]. I had the privilege of watching the Itoman Haarii during a visit to Okinawa last year. The whole history of it is fascinating.